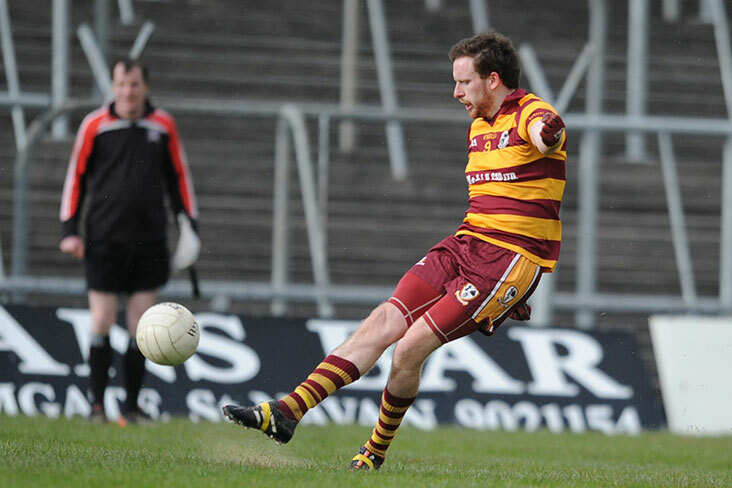 Nobber began at a blistering pace taking full advantage of the wind at their backs before Carnaross replied with a brace from Frank O’Reilly. Nobber went on to dominate the next 10 minutes before Stephen Flattery burst forward, soloing throw the black and amber defence, to tee up Decky Reilly, who punched it into the net. Two more scores before the half followed: first from midfielder Cillian Comaskey and then a free from the boot of Decky. This left Carnaross trailing by a point at half time. The goal was crucial against the stiff breeze and left Nobber disgruntled after they had dominated large portions of the first half. Carnaross began the brighter of the two sides after the interval. They struggled to convert numerous guilt-edge chances however, converting only 2 points from a possible 6 scoring opportunities. McDermott opened his account for the day with a well taken point before Reilly added another free. This enabled Nobber to stay in touch and indeed, they might have taken the lead, were it not for the boot of goalkeeper McNiffe who denied Paul Meade a goal in a one-on-one opportunity. Nobber kicked a number of frees wide facing into the cutting wind, but still Carnaross could not shake them. Porter steadied the ship with a trademark over the shoulder effort before Decky scored his third point from out on the right. Nobber were again unlucky not to raise a green flag but Peter Farrelly smartly denied them on the line this time, as Nobber’s frustrations grew. Frank O’Reilly curled over a long range effort to place some daylight between the sides but Nobber’s experience was telling as they chipped away at the lead again, with time elapsing. Tempers threatened to boil over before John L’s diagonal ball was met sweetly by Comaskey who chalked up Carnaross’ second fisted goal of the morning. McDermott concluded the maroon and saffron men’s scoring with a delectable effort as Nobber tried in vain to conjure up a goal. Carnaross: Shane McNiffe, Peter Carpenter, Peter Farrelly, Ian Donoghue, Stephen Flattery, Tómás Plunkett, Pierce Fleming, Cillian Comaskey (1-1), Niall McDonnell, Frank O’Reilly (0-3), Cian O’Reilly, Killian Porter (0-1), Decky Reilly (1-3), Dermot McGee, Paddy McDermott (0-2). Subs: John L McGee for Porter, Luke Gillic for McDonnell, Cian Gillic for Cian O’Reilly.